As an American manufacturing company, Marlin Steel is dedicated to providing clients with top-quality parts and products. With the use of advanced automated manufacturing techniques, Marlin Steel can meet very tight design tolerances with consistency and speed. The Precision Metalforming Pioneer award. 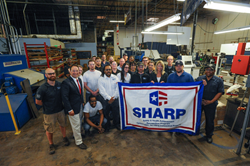 In 2013, Marlin Steel was one of only three U.S. companies chosen by the Precision Metalforming Association and The Hitachi Foundation for this honor. Being named to the Inner City 100 two years in a row (2012‐2013) by the Initiative for a Competitive Inner City. We were identified as one of the 100 fastest‐growing companies based in a U.S. city. Marlin operates in an Enterprise Zone designed to bring jobs to South Baltimore. Marlin Steel was ranked as the 162nd fastest growing private manufacturer in U.S. by Inc. magazine on its “5000” list of fast‐growing U.S. companies. Learn about these awards and more by checking out the Marlin Steel Fact sheet. Marlin Steel Named to the Prestigious Inc. Inc 5000 for 2013. Inner City 100 2013 Award Winner Marlin Steel. Marlin Steel Named to the Prestigious Inc. 5000 List for 2012. Inner City 100 2012 Award Winner Marlin Steel. Initiative for a Competitive Inner City -inner-city100winner Marlin Steel - 2012 Inner City 100 Winner! San Francisco Chronicle - Marlin Steel Wire Wins International Leamarlin-steel-wire-wins-international-leadership-awarddership Award. Competitive Advantage - Baltimore Regional Employer of the Year Award. Drew Greenblatt gives tour to VIPs for the Regional Baltimore Employer of the Year Award. 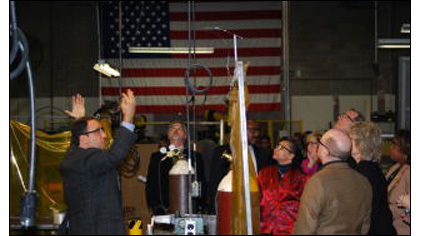 Mr. Simon Matthews, Plant Manager, gives plant tour to prominent business leaders in Maryland. Drew Greenblatt is Baltimore City Mayor and Baltimore County Executive James T. Smith, Jr.